Today’s first reading might sound a bit familiar to our ears. It is taken from the Book of Isaiah, from a section also known as the Suffering Servant Songs. It sounds familiar because it is also read during the great mass at Palm Sunday, at the beginning of Holy Week. This was not done by accident. By placing such an significant reading next to today’s Gospel the church is telling us that today's Gospel reading is of great importance. In fact some theologians have stated that what we are witnessing in today's Gospel is a key moment in the history of Christianity, one of those moments in the life of Jesus which exist outside of time and space. To put it plainly, when you hear people say that the words of Jesus are eternal, they are talking about His words in a Gospel reading like this. Such a simple question, and yet, men who for months had spend 24 hours with Jesus, men who had seem him heal the sick and feed thousands of people, couldn't find the words to answer.. In their silence we can almost sense their confusion, up until then they have been witnesses to the greatest events in the history of mankind and now… now for the first time, they are asked to stop, reflect and explain what did it all means to them? Who is this man? Every year when I teach Religious education to our teens, the very first time we meet I ask each one this same question, “Who is Jesus to you?” and invariably I get the same answers “ He is my friend“,”Someone I can trust, someone, who helps me when I need him, someone who listens” For these young people, as it was for the apostles, is very difficult to express who this mysterious historical figure is to them. Since in my class I do not let them stay silent, they all fall back into what I call your standard Jesus description: someone that sounds suspiciously like a bigger version of whom they want be. Now, I don’t want to give you the impression that our youth are any different than your average Catholic. I’m willing to bet that when it comes to stating who Jesus is. if I were to ask the same question of adults, I would get many similar answers. To me the amazing thing is that this question is truly eternal, although it was asked two thousand years ago, its echoes reverberate every day in the life of every Christian. 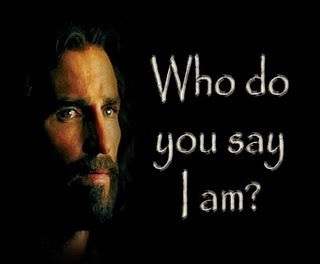 “Who do you say that I am” is a direct question our Lord asks to His disciples, not only the ones walking with Him that day but all of his disciples throughout the ages; and even after two thousand years of reflection we as the apostles that day are as incapable to finds the words to describe who he is. So the point of reflection for us today should be how would we answer this question. Personally I have reflected on this question quite a bit and I have found that the easiest way to give an answer is not by what we could say about Him but by what we do because we know who He is. We show who Jesus is to us by the way we live our lives. How do we say Jesus is? He is the reason why we feed the hungry, clothe the naked; harbour the homeless, visit the sick, and ransom the captive. He is the reason why we love our enemies, and pray for their conversion. Why we pray, attend mass and have an active life in our community. He is the reason why we suffer with the suffering, and rejoice with the joifull. To put it in short words: When we live in the way he told us to live, we realize that as disciples of the Lord, when we love, we show in our actions who he really is, our Lord and our God. God bless you my brothers and sisters.